Satellite messaging terminals provide a fiscally responsible way to automate machine-to-machine (M2M) communications for tracking, monitoring and messaging. For many monitoring and control applications, the ability to send regularly scheduled messages and one-off transmissions is all that is required. The technology meets the increasing demand for richer information in mobile and fixed remote monitoring applications and allows mining companies to share data across diverse operations without the added cost associated with continuous connectivity. Many mining companies are turning to satellite communications to track the location of their heavy equipment and trucks. If occasional position information were needed, a wise choice would be a battery operated satellite-messaging terminal with an omnidirectional antenna that requires minimal installation and virtually no maintenance. If more detailed position information is required, a satellite terminal that can plug into the power of the vehicle is even a better selection. Once location and usage data of equipment fleets are established, mining companies can immediately start collecting data to make intelligent fleet management decisions. For instance, a monitoring application can locate missing equipment, distribute vehicle usage across the entire fleet and plan for maintenance activities. This can have a sizable impact on capital expenditures, as well as overall cost savings and operational efficiencies. The slow and manual collection of data from mission critical remote monitoring stations can be costly in terms of time and budget. 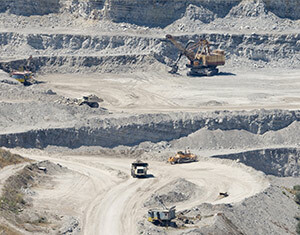 With satellite monitoring technology, mining companies can eliminate routine site visits with an automated water level monitoring system. For instance, a mine in Australia needed to regularly monitor water levels of a borehole and report that information to the state’s environmental protection authority. The issue for the mine was how to collect the information in a regular and timely manner, given monitoring points are only accessible by foot. The final solution relied on sensors connected to a satellite messaging terminal. Information is sent via satellite at regular intervals as well as when the system raises an alert when a parameter that is being monitored has crossed pre-determined thresholds. With the satellite terminals in place, environmental engineers no longer have to travel to the monitored sites as often and now receive immediate notification when a specific parameter has been breached. Harsh weather can have detrimental effects on mining operations. While rain and wind cannot be controlled, remote weather stations can go a long way in providing the information needed for activities such storm detection, flood and lightning risk management and scheduling blasts. 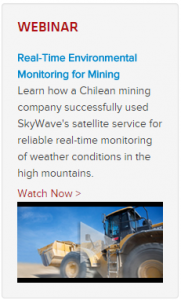 A mining company in the remote mountains of Chile is using satellite terminals and data loggers to collect weather information in remote areas. Sensors measure environmental conditions such as temperature, rainfall, wind speed/direction, humidity, barometric pressure, and solar radiation and transmit them every 15 minutes. Analysts now have real-time and historical data for forecasting and also know when to keep mining operations running or to shut them down to protect people and equipment. Liquid tanks are a common asset in our industrial landscape. Many of these work quietly in the background as their large, yellow and mechanized counterparts take the spotlight for performance and functionality. Rather than manually checking tank levels through site visits, mining companies are turning to automated tank monitoring using satellite technology. With satellite messaging terminals, notifications can be set up to alert personnel when a refill is needed and can provide an overview of all of the tanks and their levels. The automation of the tank refilling process allows mining companies to plan which fluid needs to be filled and where the tanks are located, making efficient use of personnel time and vehicle use. Ensuring the safety and welfare of employees, especially at high-risk sites, is a constant concern for many companies. A mining company operating in the Democratic Republic of the Congo (DRC) is faced with the daily safety concern of their contractors, geologists and managers traveling on unpaved, unsafe roads for exploration work. Focused on reducing the number of accidents and increasing the overall security of their traveling workers, the mining company opted for a vehicle tracking solution that used a satellite-cellular tracking device. This solution allows the company to reliably and continuously track vehicle speeds, whether employees are traveling during prohibited times (such as after dark) and whether employees are moving through high-risk areas. A panic button is also available to notify dispatch of any emergency, road block or vehicle malfunction. The real time visibility supplied by a dual communication device offers a much-needed layer of safety and security for employees traveling through vast areas over difficult terrain. Remote monitoring and operations management requires technology that delivers consistent, reliable communications service. When satellite messaging technology is integrated into automation processes, the mining industry has the tools and the information to increase productivity and decrease costs across the enterprise, achieving the ultimate ROI. This article originally appeared in SatMagazine.